Paul Pogba and Antoine Griezmann have reportedly gone the extra mile after getting custom World Cup winner rings made for the France squad. 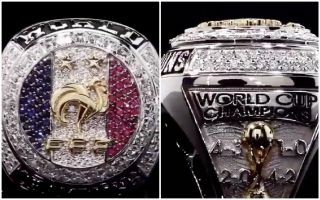 As seen in the video below, the rings are essentially based on the idea and design of those given out to the respective champions in the NBA and NFL as well as other leading US sports. Both players have been regularly spotted at games in the USA as well as wearing jerseys of their favourite basketball teams, and so clearly they have taken inspiration from that. However, they look to be pretty expensive gifts for the France squad, who memorably lifted the World Cup in Russia last summer after defeating Croatia in the final. It was a moment and achievement that will be forever written into French football history, and so perhaps we can’t begrudge Pogba and Griezmann doing more to celebrate their commendable success.